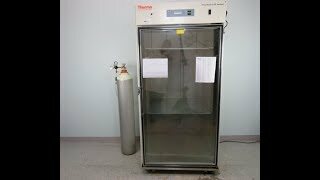 The Thermo Forma 3950 is a large capacity reach-in incubator also known as an environmental chamber. This robust high-performance incubator features a horizontal laminar airflow system which eliminates the risk of sample desiccation due to poor temperature uniformity. The airflow of the Thermo Forma 3950 environmental chamber promotes the best growth environment from top to bottom. The interior of this reach in incubator is constructed out of high-grade stainless steel making the Thermo Forma 3950 ideal for optimal cell culture growth. This Thermo Forma reach in incubator comes with an internal electrical outlet for an additional peripheral equipment such as a shaker, stirrer, lab rocker and others. The Forma 3950 comes with two access portholes to allow for the addition of external probes, sensors, and power cords. Designed with built-in alarm and heated glass door for minimal condensation, this environmental chamber has it all. The Thermo Scientific 3950 has a temperature range of ambient to 50 degrees Celsius and sensitivity of plus/minus 0.1. The Forma 3950 comes on four rolling casters allowing you to easily move the incubator from one spot to another within your laboratory. Moreover, the Thermo Forma 3950 comes with microprocessor controls allowing to the highest quality of performance on today’s environmental chamber market. This Thermo 3950 CO2 Incubator has been fully inspected and reached temperature without issue. All of our lab equipment comes backed with our standard warranty. Should you need any questions, please don't hesitate to contact us.